So what does that average B2B marketing organization look like today? And what are the challenges that organizations must overcome to get to best-in-class? Challenge #1: We implement technology to solve our B2B demand generation problems, but we fail to substantially update our underlying processes and roles; thus, we find technology by itself has not really solved our problems. Clearly the adoption of technology – particularly marketing automation and CRM – among B2B marketing organizations is on the rise. Yet within organizations that have adopted the technology, we too often see a consistent pattern of doing what it takes to initially implement the technology – creating minimal definitions and scoring models to get going – but falling far short of a complete overhaul of our core processes and roles. So we never fully leverage this technology. We see validation of this in data from The Executive Benchmark Assessment, published by Bulldog Solutions and Frost & Sullivan earlier this year – an assessment that sampled a group of 250 B2B marketers. (Graphics below used with permission.) On the surface, a majority of more-advanced B2B marketing organizations claim that they share common objectives and goals with sales and that they have common lead-stage definitions. Yet I’d note this is the minimum level of what is required to get up and running with marketing automation technology and CRM. Stated differently, on the surface – i.e., just enough to work together and to implement the technology – B2B marketing organizations are evolving, but that evolution stops early into the adoption of the technology, and as we’ll see below, the results significantly limit the outcome. As I hinted at above, this story changes when the questions look at the outcomes of B2B demand generation programs from these same high performers, many of whom did adopt marketing automation technology but didn’t necessarily overhaul their legacy views of demand generation processes and integration. We see results that are nearly the inverse of what we saw above and that point to dissatisfaction and poor outcomes. The synthesis? These organizations started to get aligned – enough to adopt the technology – and they created definitions. But their initial definitions were not on target and/or were not refined, and they did not carry through with improvements and fundamental process/role change. The result is that less than a quarter of B2B marketing organizations believe their efforts are keeping the pipeline filled. And so we find that updating definitions and adopting technology is not sufficient. Success with modern B2B demand generation – and getting to best-in-class – also requires substantial updates to processes and roles. It requires sophisticated lead management processes, a content marketing strategy and a new B2B marketing skill set that blends marketing operations with holistic, buyer-driven nurturing. Amen! Does joining a gym make you slim? No. Does buying marketing automation solve the sales lead problem? No. When more then 6 out of 10 say they don’t have enough sales leads to satisfy salespeople, they have a real problem. The unfortunate situation is that companies need to tear down marketing and rebuild it. They need to rethink their value. They need to see the world through fresh eyes. They need to understand messaging and realign roles. They need great content – personalized and engaging. Marketing is today short staffed, underfunded and in a bind. This is why they ought to look for outside help. This is a nice post detailing the problems occurring in the B2B sales/marketing process. Marketing is not “branding,” and too many “branders” have led organizations down delusional, “feel good” paths. Marketing is and has always been finding a need and filling it. A marketer’s role in organization is to provide the “intelligence, weapons, and ammunition” for the people “in the trenches” – sales. Marketing Automation tools help marketers do this. The key word here is “help.” The best platform out there is worthless if you don’t have smart humans running it. Humans (sales and marketing working collaboratively) need to create and sustain logical processes that encourage efficient, swift processing and distribution of revenue driving information, and build platforms around these processes. Don’t put the cart before the horse. People, process and technology have always been important; marketing has always been short-staffed and underfunded. What’s new, as Sirius Decisions points out, is that the role of marketing is changing, and thus marketers need to learn to do new things. I think Trish Bertuzzi’s comment yesterday hit the nail on the head — in a world where new approaches are needed, what we have are experiments, not yet best practices. I’d go further and say that things are changing so quickly that the ability to experiment is itself a critical requirement. People, process and technology must be adjusted to support constant experimentation and to balance that with the need to deliver results. In short, we need to focus on what it takes to be flexible. One critical need is the ability to measure outcomes so we can know which experiments have failed or succeeded. I look forward to tomorrow’s post on measurement. Anyone who has implemented Marketing Automation (or any tehcnology for that matter) understands that the technology is only the enabler. Marketing success comes from having a compelling value proposition and communicating it your tarket market thruought the buying lifecycle. Technology can help us communicate but cannot not help us concieve the message. Technology can facilite and a streamlined custom acquisition process but cannot create the new process. The benchmark assessment data is good validation for the trends we see on a daily basis. Injects a dose of healthy reality. It’s much better to know there are likely roadblocks and have a plan to set yourself up to succeed by addressing them. Ignorance is not bliss. Thanks for all of the great comments, everyone. @ Jeff – It is sort of sobering, isn’t it? Couldn’t agree more that we need to rebuild on a new model. @ Joe – Well said. Horses don’t do well behind carts. @ David – Two points, first, I agree on the flexibility front. Maybe that’s the big call-out here: We need to train B2B marketers with the tools to adapt, as opposed to the legacy views of their silos. Agility. Second, I think you’ll like the third post in the series. I actually end with a quote from one of your last blog posts. @ Dan – Appreciate the comment. I would say, though, that I disagree with the statement that ‘anyone who has implemented’ gets it. I think that’s my point: That far too many continue to implement technology without ‘getting it’ and realizing it is only an enabler. @ Amy – Thanks to Bulldog Solutions for the great data charts. Truly appreciative of your generosity in sharing this with everyone. Adam, I agree that technology is an enabler of using marketing to drive leads and sales; Not the solution in itself. It’s like gas in the tank of your car. You can’t get there without it, but you still need the car (process) and driver (people) to get you there! Adam, Great topic! As an eBusiness Strategist and Software technologist, I have worked with too many organizations that look for to technology to solve their problems. The senior management in these organizations are trying to transform their organizations by investing in the design and development of an “easy button” if you will. However, as you eloquently argue the technology is only the enabler to transformation. The truth is that there are no “easy buttons” when it comes to transformation. I percieve the hope is that if they invest enough in the techno gadgets and sophisticated applications, they will somehow do things better. In fact, if they don’t have a strategy for changing the organization behaviors and processes that are causing the problem in the first place, they are only failing better and faster than they were before the technology was implemented. Although well thought out corporate strategy and tactics should drive technology investment in most cases, there a cybernetic relationship between the two. Essentially, there is a feedback loop that exists between busines and technology. The feedback from technological innovations should be fed back into the strategic planning processes of the organization. As a result, cultures, values, behaviors, org structures and processes will be be challenged. It is only when the feedback loop is closed and the challenges of transforming the organization are embraced, that businesses will truly reap the rewards that technology enables. I believe that companies that embrace the philosophy continuous improvement tend make the transformation faster, better and cheaper. 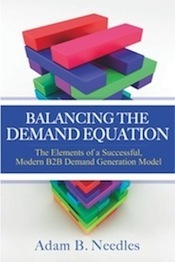 on January 7, 2011 at 10:19 am Why Do (Well-intentioned) B2B Demand Generation Efforts Fail?